I’m transferring this from my old SFF Net newsgroup, but it’s still technically the current report on this project. You will notice that I haven’t worked on this story in well over nine years. I’m not sure I’ll ever do anything more with it. The theory at the time was that I would expand some of the George Pinkerton stories into a series of books for middle-graders; I no longer think that’s a good idea. Comments: I just did a first pass, filling in some obvious bits. I haven’t really gotten serious about it yet. Posted on May 23, 2017 by Lawrence Watt-Evans in Progress Reports. Got a bunch of stuff that I hope will be out this summer. First off, Stone Unturned is at Wildside and they said they wanted to get it out ASAP. I have no details, though. 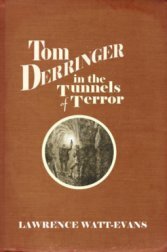 Tom Derringer in the Tunnels of Terror has been edited; I’m not quite halfway through incorporating (or overruling) the editorial changes. I spoke to the illustrator yesterday; she says she has the pencils done for the frontispiece, but hasn’t inked them yet. I’d guess it should all be done soon and should be out in July if all goes well. The audiobook of Dragon Weather, which was originally scheduled for Christmas 2016 but got delayed, is now entirely recorded, but still being edited. I haven’t yet listened to it to give it final approval. 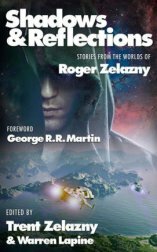 My short story “The Lady of Shadow Guard” will be in the Roger Zelazny tribute anthology Shadows and Reflections, which is scheduled for next month. There’s this anthology with a June 1st deadline that I was invited to submit to. I had an unfinished story called “Fearless” that I thought might be a good fit; I dug it out, looked at it, re-read the anthology guidelines, and decided no, that wouldn’t work. So I got out another unfinished story called “The Dancing Teacher,” and worked on it off and on for months, and kept being unhappy with how it was going. I repeatedly backed up, throwing out several pages each time, to try different approaches, and eventually decided that the problem was that the story I had set out to write years ago did not want to be forced to fit the anthology guidelines. It wasn’t a good match after all. So I put that story aside, and started an all-new one that’s now on its third title, “Sorcery of the Heart,” which was designed from the start to fit the anthology guidelines. I’m on page 8 of an estimated 25-30. I haven’t had to back up, really, but I did revise the lead character’s backstory pretty drastically. With less than ten days left, I don’t know whether I’ll meet that June 1st deadline or not, but it’s what I’m working on right now. Posted on May 22, 2017 by Lawrence Watt-Evans in Status Report, Stone Unturned, Tom Derringer.